ABSTRACT: Wedocument the occurrence of agglutinated foraminifera inUpperCretaceous (Campanian) sediments recovered during the Arctic Coring Expedition (ACEX), IODP Expedition 302. 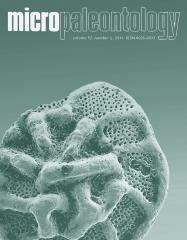 Foraminiferal assemblages consist entirely of agglutinated taxa with 29 taxa including three new species (Labrospira macilenta, Recurvoidella arctica, and Recurvoides trochoidalis). The agglutinated assemblage from the Lomonosov Ridge represents a shallow, probably restricted, brackish environment, and displays some taxonomic affinity to Late Cretaceous assemblages described from the Beaufort-Mackenzie basin. There are no species in commonwith coeval assemblages described from the southwestern Barents Sea or Western Siberia, and also only several cosmopolitan species in common between the later two regions. Therefore we suggest that the Arctic Ocean was probably isolated from the North Atlantic faunal province during the Late Cretaceous, with very limited or no marine connections between the Arctic, North Atlantic and Western Siberia over the Barents Shelf.